What is Company Culture and How Does it Affect a Working Environment? Organizational culture outlines the way that an organization’s employees intermingle with each other and the way they complete their tasks. Organizational culture revolves around beliefs, symbols, values, and rituals that oversee and rule the working style of employees present within a company. Corporate culture is binding the workforce together. It also gives a direction for the corporation. If changes are occurring in an organization, the biggest challenge any business will face is cultural change since the employees have become accustomed to the way the organization is already carrying things out. Why is Company Culture Important and Why Does it Matter? Company culture is an important aspect for any business. Employees are much more likely to love and relish their time in that workplace when they find themselves fitting in with the corporation’s culture. 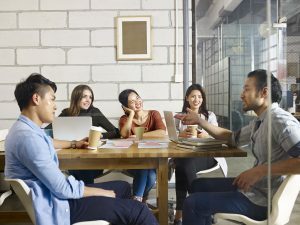 Employees will also be inclined to enjoy doing their work when they see that their values and needs are consistent with others in the workplace. They tend to grow and improve their relationships with their coworkers, which tends to make them even more productive. Then again, if an employee works in a company where they just don’t seem to fit in and adjust to the company culture, they are more likely to get less pleasure from doing their work. Let us take an example of this scenario. If an employee prefers to work independently and freely, but happens to work for a corporation that stresses teamwork, that employee will be more likely to be less efficient and less happy. If you happen to work at a corporation that has a customary management style, you will find your job responsibilities to be very clearly defined. There might not be as many opportunities to develop and advance without going through their transfer process or formal promotion. As compared to a more casual place of work, where employees will have more possibilites to take on fresh, new projects, along with additional roles. How does Company Culture Affect a Working Environment and Employees? Exactly how does the culture of a company impact individual performance? In order to deliver a competitive advantage, a company’s culture should be widely communicated and strongly reinforced. Each and every one of the employees must share its beliefs and values. In an organization where the culture is strong, the employees feel valued. The staff enjoys the control they have over their jobs. They don’t feel powerless. Whether it is by working at home or selecting their own projects, employees who feel valued are able to make decisions that help achieve a much greater level of performance. A positive company culture is able to ensure that its employees are not only satisfied with their occupations, but also loyal to the company. This can be tremendously beneficial to a company who has a competitive hiring atmosphere. Employees are more interested in becoming a part of, as well as staying with, an organization where the company culture promotes employee development, offers flexibility, and supports a work-life balance. By improving and working towards employee satisfaction with respect to a supportive and strong company culture, there can be a drastic decrease in recruiting, training, and hiring expenses. At the same time, it will improve the morale of employees and increase profits. In companies that have good communication practices, employees know that their ideas and opinions will be welcomed. If employees feel that they have been heard, they do not carry a resentment, which eventually leads to negative morale, absenteeism, and termination. A company culture that is communicative will lead to innovation, greater participation, and creativity in the organization. Once an employee is hired, educated, and oriented to the organization, they either feel energized and supported or frustrated and undervalued. When employees feel that they are valued, they are more willing to be enthusiastic, involved, and engaged. https://www.completecontroller.com/wp-content/uploads/cclogo_main-long-300x63.png 0 0 Complete Controller https://www.completecontroller.com/wp-content/uploads/cclogo_main-long-300x63.png Complete Controller2018-08-14 10:06:532018-08-15 09:28:45What is Company Culture and How Does it Affect a Working Environment?